Mobile and other portable credit card terminals have been around for many years. But, have they been affordable? To many, not really. Expensive hardware, leases, long term contracts, and high fees have priced credit card acceptance away from the front desk, out of the ball park. However, much of that has changed. Today, more and more merchants need to be able to accept credit cards while on the road or at off-site locations. 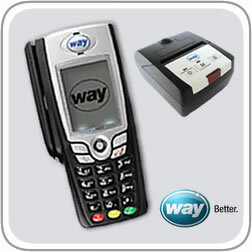 There are many wireless/mobile credit card terminals on the market. You can expect to pay anywhere from $199 - $1000 for a wireless credit card terminal. Some terminals have integrated printers while some have printers optional. Monthly wireless service fees vary but are generally around $20 per month. Many credit card processors are now offering shorter term contracts. Some have no contracts at all. One of the most popular, and fastest growing segment in this industry, is the short-term or single event usage account. This merchant account offers great flexibility for fundraisers. For example, a school PTA or other group is holding a one night fundraiser and wants to accept credit cards. Now they can. Many charitable groups holding silent auctions or other fundraisers can sign up, rent the terminal, process their transactions, and return the terminal once their event is over. These types of services are finally being offered to a large group of merchants who until very recently, were stuck accepting cash and personal checks. Statistics have proven that buyers are apt to spend more money on a credit card than by check and who carries cash anymore? PayByWeb makes the process simple by providing a FREE wireless credit card terminal to all new merchants applying for a wireless/mobile merchant account. Rates are 1.74% plus .25 per transaction. Merchants with short term events needing credit card acceptance can rent the terminals at a very low cost. As the demand for mobile and wireless technology increases, merchant account providers must keep up and offer the solutions to supply that demand, while keeping those merchants happy.